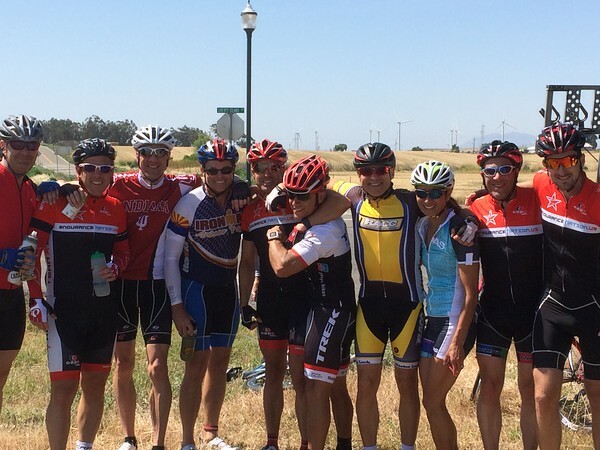 This year Coach Rich conducted a training camp on the course of the Tour of California…during the race! This dynamic makes for one of the most unique training camp experiences you find. 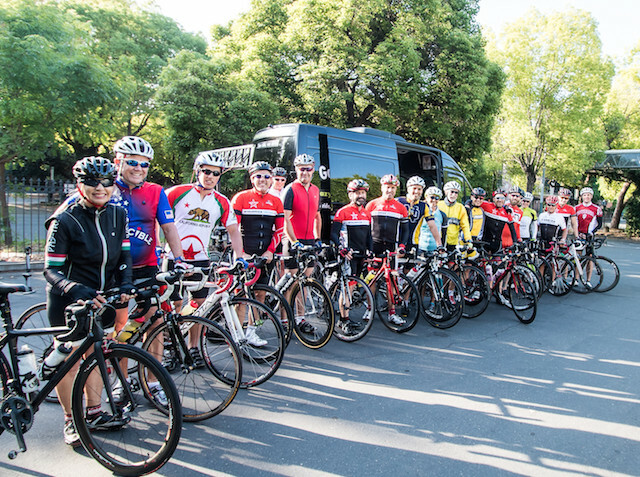 In this series of posts, Rich will give you his Stage by Stage report of the camp. 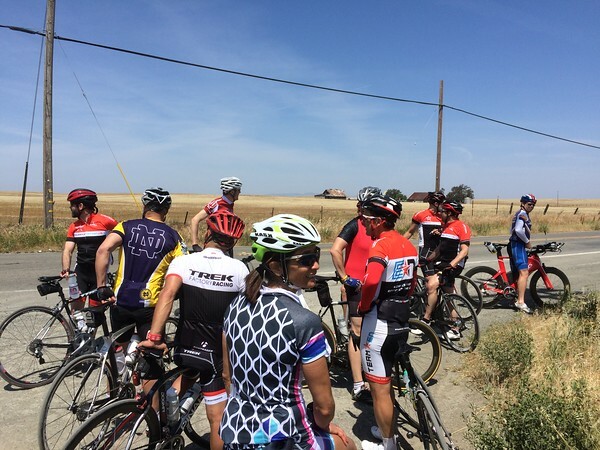 This was my 6th running of the Tour of California Training Camp, after a brief hiatus in ’12-14. This year was our best ever and I’m exited to add this extremely unique week to our training camp offerings! The overview of the camp is that we ride 6 of the 7 stages of the Amgen Tour of California, leaving each day about 3hrs ahead of the pro peloton. We ride on the route of the stage, complete with course markings, semi-controlled roads, intermediate sprints, KOM’s, feed zones, other spectators and cyclists on the course. 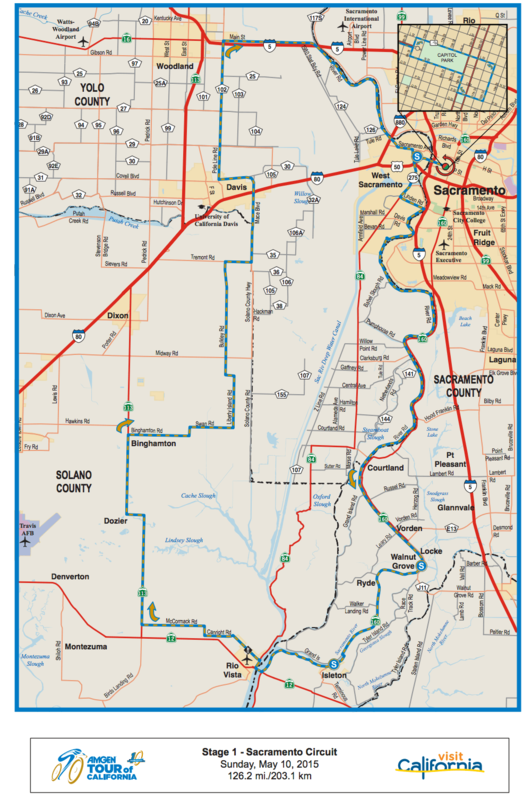 The race usually starts in the center of the state, in the past in Sacramento, or Santa Rosa, or San Francisco. This year started in Sacramento. The race usually finishes in SoCal, this year in Pasadena. In addition, each stage is point to point to point. That is, the race will start in one town, finish in another, and start the next day somewhere else. The net is that each day we identify a point on the course we must reach before getting shut down by the race. At this point we roll up the campers, consolidate the bikes and gear in the vans, maybe watch a bit of the race, and then drive to our destination town for that evening. This year we had 18 campers and because of the travel and logistics involved with moving this rolling road show around the state, I don’t have room to carry bike boxes during the camp. 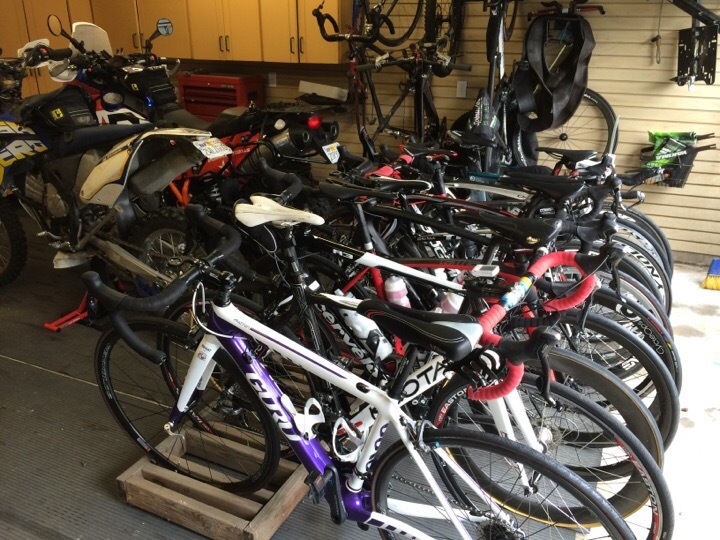 Campers flying in had to ship their bikes to me to arrive no later than Thursday and I assemble the bikes. 9 bikes assembled this year. SoCal campers who chose to drive up with us to Sacramento on Saturday met at my place with their bikes and bags. Finally, 3 campers met us in Sac with their bikes. The net is that my complete footprint for this camp is 1 van capable of carrying 14 bikes and 10 passengers, another van capable of transporting 4-7 bikes and 11 riders, and a third van for all of the luggage and an additional 4-7 bikes. In addition, I have three drivers/SAG folks (Xavier, Brendan, and my wife Joanne) and Jonnie D, Michele Moreno’s BF, as my LT on the Road to help me lead the rides. And of course, Riley the WunderPup, the Official EN Mascot! As you can see this is a TON of moving parts and we haven’t even begun to ride our bikes yet! Xavier, my best find of the camp! 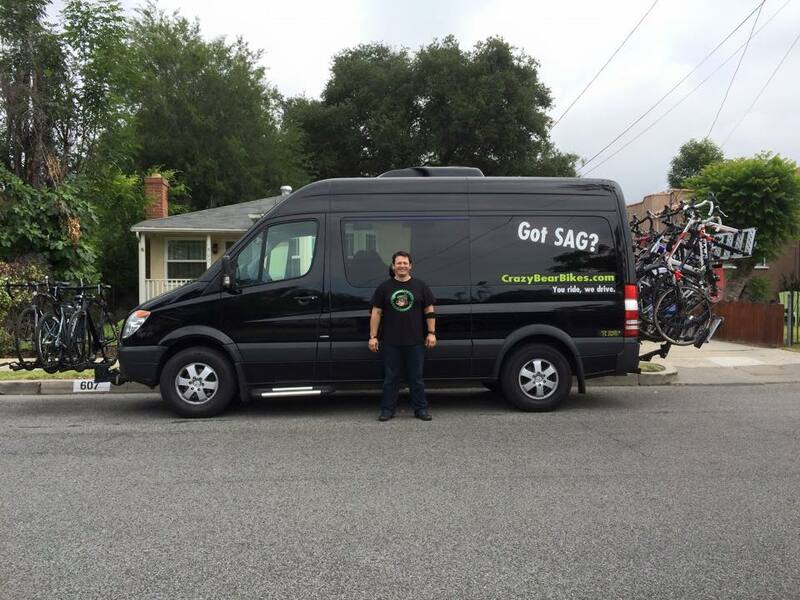 I ran into him at the top of one our local climbs and hit him up about his van, as I have a total Sprinter mancrush. While descending behind him I started to do the math on the number of bikes he could transport, got his card, and he signed on for the camp. HUGE asset for us! So on Saturday, all three vans left my house for the ~8hr drive to Sacramento with all of the bikes and SoCal locals. The drive was largely uneventful and the entire camp came together at the Holiday Inn Express in Sacramento, with many of the campers having been picked up and shuttled to the hotel by TeamEN member and Sacramento Local Bob Nelson and his wife Christie! So awesome! We had our first camp dinner at the Old Spaghetti Factory, where I briefed the crew on how the camp was going to work, set expectations, and generally prepared them for a very, very busy week of incredible riding! The campers sorting themselves organically into A and B squads. Me getting a feel for the group riding skills and comfort of the campers. As you can imagine, rough pavement and strong winds made it tough to settle into organized group riding but I was very surprised at just how well the majority of the campers did. I knew it would only get better across the week and I took this as a very good sign for how the camp was going to go. Awesome organization for Day 1 of Riding! Good times coming! A-Group, mid ride stop. Note the windmills in the background, never a good sign. The riding also included several unexpected miles on a dirt road. A-Group consolidating at the end of the dirt road, after the B-group passed through to get some distance on us. During the ride we contested for Sprint finishes…and Feed Zone finishes, and since there was no official sprint line in Davis we decided the Davis city limits sign would be the Official EN ToC Stage 1 finish. So we began looking for high buildings on the horizon telling us we were getting closer but we all targeted on the water tower in the distance. I forget who took the sprint but we finished our ride a couple blocks later in a grocery store parking lot, where we loaded up, fueled up, watched the race roll through and then got on the road to our next town of Grass Valley, about 90′ away. Joanne swung the cargo van by the airport to pick up Steph Stevens, who had raced IMSG the weekend before, then a Ragnar event in Boston on Fri and Saturday (I think) before flying out to Sacramento to meet us on Sunday. And Steph lives in the Denver area so do the math on that week! Joanne and the admin staff shoot ahead to the next hotel to check everyone in and unload bags. Camper vans roll in, campers go straight to the rooms while staff unload, clean, and inspect all bikes. Campers come down to get their bikes and hit the streets for dinner. About 6-8 of us had a great dinner at a Thai place and everyone else hit up a brew pub, diner, etc.